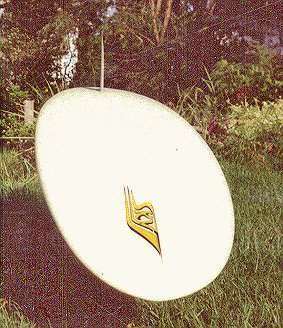 1980 Sky, Mini Mal by Bob McTavish 7ft 2"
Rails: "low round, like a golf ball"
1.White and Yellow laminate single fin. 2.Fin Box with molded Multifins JB2 8 1/2" x 6" (base). 3.Two boxes added to complete Thruster/Tri fin format. 1.Red ribbon 'Sky' at sweet spot down stringer. 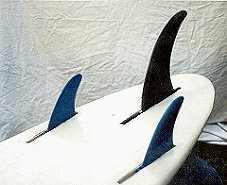 1.Fin replacement with fin box.Various single fins used. 3.Bottom sanded (loss of decal) and relaminated with white pigment/6 oz. glass. Side fin boxes added. Various single/tri/Thruster fins used. 5. Plugs (4) filled in and yellow spray added. Surfer magazine Vol 18 # 4 November 1977 pages 102 - 103. Bob McTavish : It's much more fun than it looks...and it looks like fun. ..Bob McTavish on reprising the longboard/Malibu design for the late 1970's.